Instagram has become a very strange thing. That, or a very normal thing, depending on who you ask. Teenagers everywhere and even people in their 20s and 30s have become completely addicted to it, never missing a post, allowing people to judge them on their posts, stressing out to people’s reactions to their posts, etc. Insecure teenage girls even use airbrush apps to whiten their teeth in their selfies or even post pictures of other people in place of themselves. Pretty much anything goes and people go to new levels trying to get views, likes, comments and other attention from complete strangers. Most look up to celebrities who have to take their clothes off in an effort to get views. The whole thing is quite depressing if you ask me. Anyways, many teens now have hundreds of followers, so many that any chance of possibly being themselves at all has completely gone out the window. The fix for this is Snapchat and a second Instagram account that they share with a smaller circle of friends. This second Insta account is called their Finsta account, short for Finstagram or Fake Instagram account. Sometimes their original account is called their Rinstagram accout, short for Real Instagram. The irony here is they act real on their fake account and fake on their real account. Just don’t tell them that! Great. Does my kid have an Finsta account? If you are active on Instagram you may not know about your kid’s Finsta account unless they followed you first, as the accounts is almost definitely locked / private. This became popular after Instagram recognized the need and demand and launched multiple account support in 2/2016. Below is a pic. Take note at the arrow to the right of the username. 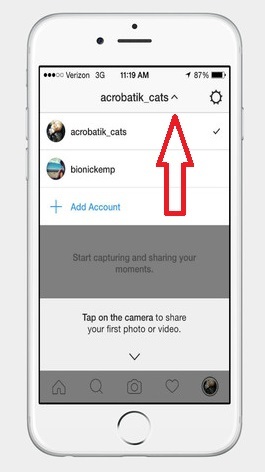 This arrow means the Instagram app is managing multiple accounts. If you see this on your child’s, friend’s, boyfriend’s or girlfriend’s phone, they are managing more than one Insta account via their Instagram app. If you couldn’t just ask them, or weren’t invited, you could sneak a peek at their phone. If you see this you can bet they likely have a Finsta account. Now relax, it is a good thing they are finally being themselves.